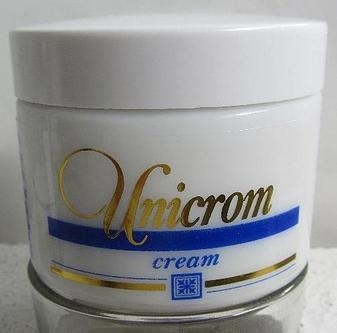 Bleaching Cream for Black Skin - Pharmacy Nicosia | Bridge House Pharmacy Nicosia "Bridge House"
Bleaching Cream for Black Skin - UNICROM Whitening Cream is designed according to the most recent specifications. Use morning and evening on hyperchromatic skin areas, like freckles due to old age and pregnancy as well as common freckles. The sun filters included protect against the formation of freckles whilst arctostaphylos extract provides colour uniformity to the skin. Close the jar after use. The effectiveness of the bleaching cream is not reduced if it darkens with time. Keep at room temperature. Aqua, Petrolatum, Benzophenon-3,Cetearyl Alcohol, Paraffinum Liquidum, Ascorbic Acid, Ceteareth-30, Tocopheryl Acetate, Phenoxyethanol, Glycerin, Parfum, Panthenol, Xanthan Gum, Titanium Dioxide, Arctostaphylos Uva-Ursi Leaf Extract, Magnesium Ascorbyl Phosphate, Sodium Benzoate, Tetrasodium EDTA, Limonene, Sodium Sulphate, Ethylhexylglycerin, Linalool, Simethicone.